The Illinois Public Labor Relations Act (IPLRA) allows employees of the State of Illinois and its political subdivisions to unionize. Under the IPLRA, if the majority of employees in a bargaining unit vote to be represented by a labor union, the union is designated as the exclusive representative of all the employees within the bargaining unit, including employees who choose not to join the union. Employees who join the union must pay full union dues. The specific provision of the IPLRA at issue requires employees who do not join the union to pay a percentage of the union dues referred to as an “agency fee.” In Abood, the United States Supreme Court had rejected a First Amendment challenge to an agency fee, concluding that nonunion employees may be charged an agency fee for the portion of union dues used to pay for activities that are “germane to [the union’s] duties as collective bargaining representative,” but not for any portion of dues used to fund the union’s political and ideological projects. Mark Janus was an Illinois state employee working in a bargaining unit that voted to be represented by a union. Janus elected not to join the union because he opposed many of its policy positions, but he was required to pay an agency fee, which was automatically deducted from his pay. Janus filed a complaint in federal court asserting that “nonmember fee deductions are coerced political speech” and “the First Amendment forbids coercing any money from the nonmembers.” Relying on Abood, the union moved to have the case dismissed. The District Court granted the motion to dismiss and the Court of Appeals for the Seventh Circuit affirmed the decision. 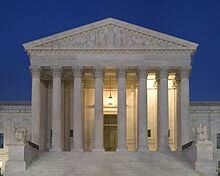 The United States Supreme Court granted certiorari to consider whether the required payment of an agency fee for nonunion, public-sector employees is unconstitutional. In Abood, the Court allowed agency fee agreements because they promoted the state’s interest in labor peace and the avoidance of free-riders. But the Janus Court rejects both of these rationales. Instead, it concludes that “[w]hatever may have been the case 41 years ago when Abood was handed down, it is now undeniable that ‘labor peace’ can readily be achieved ‘through means significantly less restrictive of associational freedoms’ than the assessment of agency fees.” The Court is equally unpersuaded by the free-rider argument, relying on Knox for the principle that “free-rider arguments…are generally insufficient to overcome First Amendment objections.” Accordingly, the Court concludes that because the state interests relied on in Abood fail to pass exacting scrutiny analysis, the Abood court erred in upholding public sector agency fee agreements as constitutional. The Court overrules Abood, holding that the agency fee provision of the IPLRA challenged by Janus violates the First Amendment. The Janus decision appears to have little immediate, direct impact on Colorado. Colorado does not currently have statutes related to public sector unions and therefore does not have any statutes requiring nonunion, public sector employees to pay agency fees. However, Janus would presumably discourage a future Colorado General Assembly from enacting a law requiring the payment of agency fees by nonunion public sector employees, because such a law would clearly violate the First Amendment as interpreted by the Janus Court. Janus v. AFSCME, Council 31, 585 U.S. ___, 138 S. Ct. 2448, 201 L. Ed. 2d 924 (2018). Janus, 138 S. Ct. at 2460, 201 L. Ed. 2d at 934. Abood, 431 U.S. at 235-36. The specific union was the American Federation of State, County, and Municipal Employees, Council 31. Janus, 138 S. Ct. at 2462, 201 L. Ed. 2d at 937. Janus, 138 S. Ct. 2463, 201 L. Ed. 2d at 938. Id. (quoting Wooley v. Maynard. 430 U.S. 705, 741 (1977)). Janus, 138 S. Ct. at 2464, 201 L. Ed. 2d at 939 (quoting Knox v. Service Employees, 567 U.S. 298, 310-311)(additional internal citation omitted). Janus, 138 S. Ct. at 2465, 201 L. Ed. 2d at 940. Knox, 567 U.S. at 310. Janus. 138 S. Ct. at 2466, 201 L. Ed. 2d at 941 (Quoting Harris v. Quinn, 573 U.S. ___ (2014)).